What do you do when you get offered a place in a Middle Distance event... while you are 30km into the run at the Outlaw Triathlon?! Not a typical scenario I grant you, but one that Karl Alexander found himself in recently when overtaken by Rubicon Middle Distance Triathlon organiser Mark Livesey. While he politely declined at the time, a few days later he changed his mind, and here Karl reports from a race where "the route is fantastic, the marshalls and volunteers are all super friendly and the banter coming over the PA is brilliant." 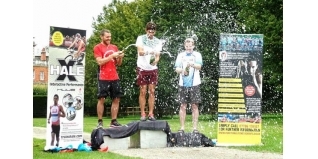 The Rubicon Middle Distance Triathlon at Newby Hall, near Ripon in North Yorkshire, is just one of three excellent events hosted over the course of the weekend. The weekend kicks off on Saturday with the Kids Triathlon with age-groups ranging from 8 to 16 years old. On Sunday it's the turn of the grown ups with both the Trident Standard Distance event and the Rubicon Middle, and it would be the longer one that I was there to race. My invite to race is one of the more unusual I've received. Whilst participating at the Outlaw last month, I was caught and passed at about 30km into the run by the event organiser, Mark Livesey. As he passed I congratulated him on a strong run and he responded by asking me to race his event... which at the time I declined, but a few days later I took him up on the offer. Arriving in North Yorkshire on Saturday afternoon, I wanted to register and give the transition area a quick recce; where my bike would be racked, where swim in and bike out were located and of course bike in and run out, knowledge that can save valuable seconds come race day. As I was participating in the Elite wave we each had our own ITU style bike racks which were named, which was pretty cool! From there we went and checked in to the hotel, and got some food and rest before race day. I was feeling relaxed if not a little tired, as I'm currently in a heavy block of training as I prepare for Challenge Weymouth, but otherwise, ready to go. We arrived back at Newby Hall at 05:30 to rack and prepare for the race, the race brief was delivered at 06:15 by Mark Livesey and was informative and funny, just the the thing to relax the nerves of competitors. Once done it was a ‘short walk' to the swim start, and by short I mean quite long... I actually considered turning on my Garmin and putting it on Strava! With the swim predominantly downstream in the River Ure, the walk to the start was needed. As we drew closer the morning air was broken by the sound of bagpipes greeting athletes as they entered the water. Shortly after 7am the claxon sounded and we were off, the Elite wave started about 25m ahead of the main field and I knew there were some strong swimmers in the group. My plan was simple; sit on the back of the group and take it steady which is exactly what I did. For the Rubicon the swim passes the exit and takes in an additional 200 meters downstream before turning back and exiting making up the full 1.9km. I exited the water and glancing at my watch saw 30 minutes tick by. This came as a big shock, I was in the leading group and have been swimming well in training. It wasn't until after the race I saw that my Garmin had recorded the swim at 2.3km, so 400m long. I can only assume that the turn buoy had drifted downstream. The 200 metre run up to T1 was carpeted and the steps had ramps installed to make things a little easier on the athletes. As I came in I noted only there were only about five bikes missing from the Elite racking so I knew I was going well. After a reasonably quick transition I was up to speed and closing in on two athletes ahead. The bike route comprises to two large loops that bring athletes back through the grounds of Newby Hall and a final shorter third loop to make up the distance. The bike course is billed as ‘flat, fast and quiet' and it didn't disappoint. I quickly caught and passed the two athletes I could see ahead and on the first long out-and-back section I could see a group of three riders in close formation. I was feeling good and was gaining on those in front. As I approached the roundabout I saw Joe Skipper heading toward me and estimated a two minute gap and counted six athletes ahead, putting me in seventh on the road. Over the next 10km I reeled in the three ahead and as I drew closer I upped my pace and overtook at speed. By the second of the turn points I had overtaken the rider in third place and was making ground on second. Completing the first lap at a shade over 25mph I was still feeling good. Glancing back I could see that I still hadn't completely dropped the three behind and over the next few miles I kept my head down and my power up and at the first turn on the second lap I could see I had really opened up the gap. By the second turn it had gone out further. Approaching the end of the second lap I could see Richard Horton (Racetime Events) coming past the transition for the last time. I accelerated and took the right hand turn at pace, out of the saddle working hard to open a gap and into second place on the road. I settled back down into my rhythm and afforded myself a quick glance... the road was empty. I realised immediately that Richard had gone into T2 without doing the final short loop. I kept pressing on and before long I was also heading into T2 and out on to the 5km, four lap course. The run course is a combination of road and farm track and takes athletes through some very picturesque vistas, none more so that the entry to the church which on a warm day provided some welcome shade. My run strategy was to take it steady and run at Ironman race pace off the bike. Within the first few miles my legs were feeling heavy, the recent volume of training beginning to show itself. Just over halfway through the second lap I was caught and overtaken by Brian Fogarty (although I wasn't aware he was on the same lap as me), who was running well. I kept to my guns and kept the pace steady. On the fourth and final lap I decided to pick up the pace and run harder. On the longer sections I could see Brian ahead and was drawing closer but the finish line came and I never caught him. I crossed the line into third place overall with Brian Fogarty in second and Kona-bound Ironman Pro Joe Skipper taking the win. All-in-all, I'm pretty pleased with this performance. I was there to race but having trained through the event the result is one I'll take gladly. I have another week of hard training before I taper off for Challenge Weymouth and, I hope, a big performance. As I relaxed after the event, I noted the number of athletes not aware of how many laps they had completed. The addition of lap wrist bands at next years edition would help to eliminate this; counting to four when you're absolutely shattered can be quite hard. From an athlete perspective it would also be beneficial if the two events were easily identifiable by their race number, either a different coloured background or the number itself, i.e. 1-500 Rubicon 1001-1500 Trident. Other than that, I simply can't fault the race organisation, the route is fantastic, the marshalls and volunteers are all super friendly and the banter coming over the PA is brilliant. See you next year!